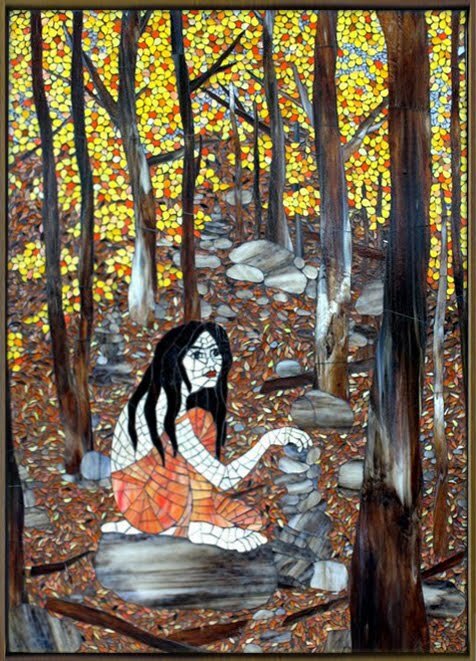 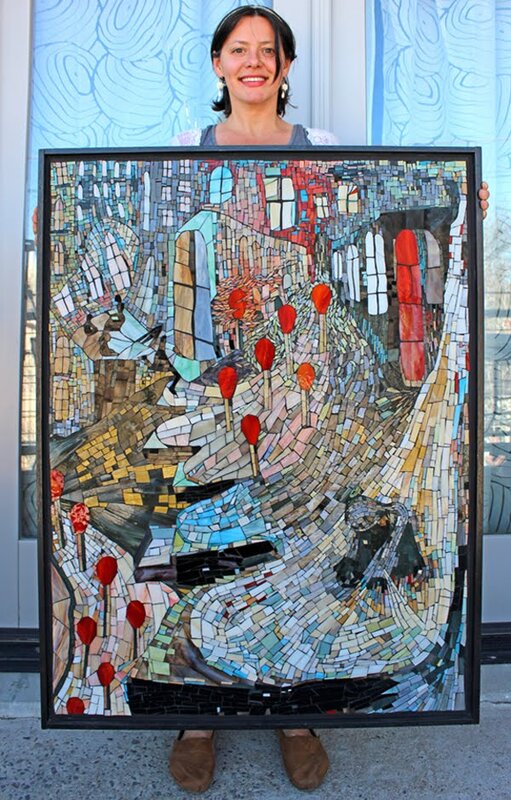 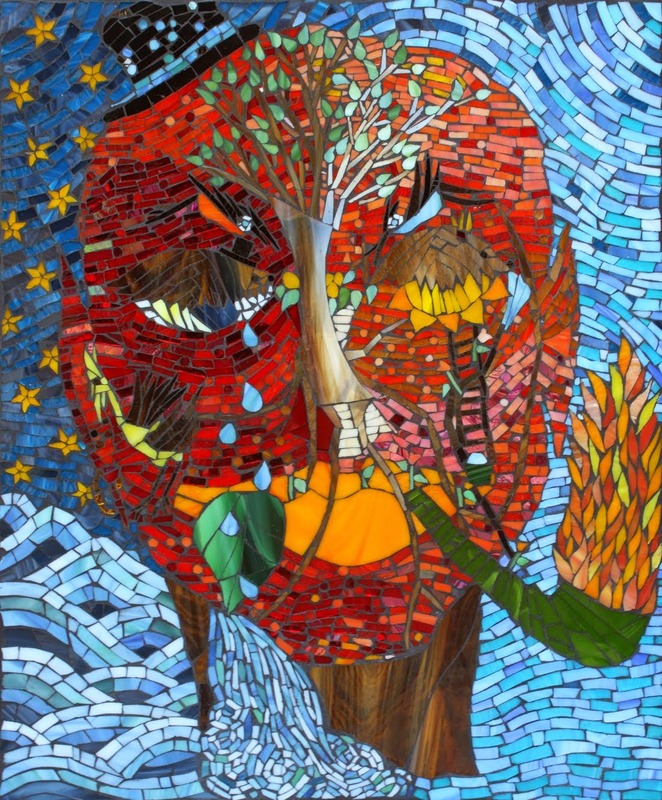 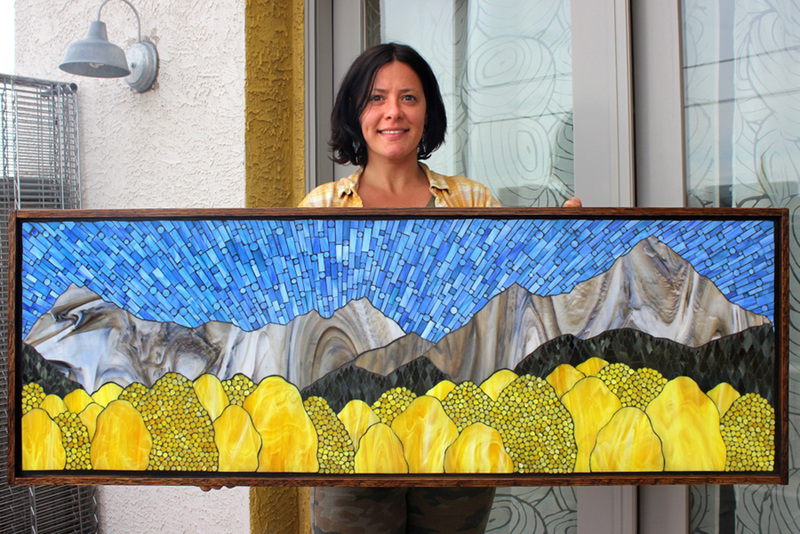 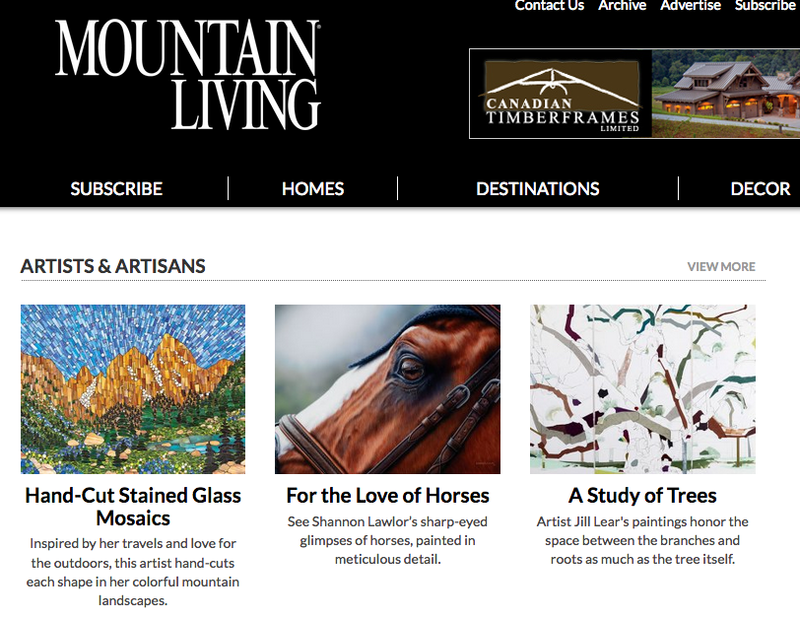 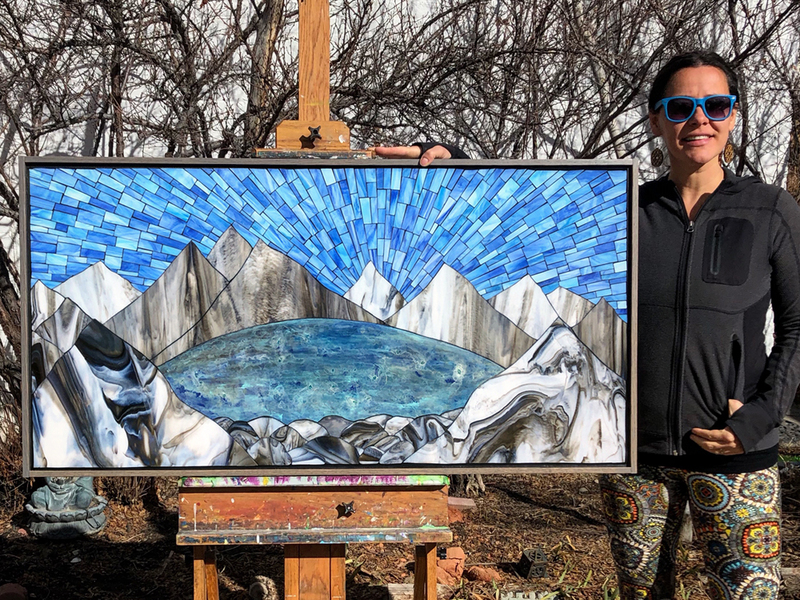 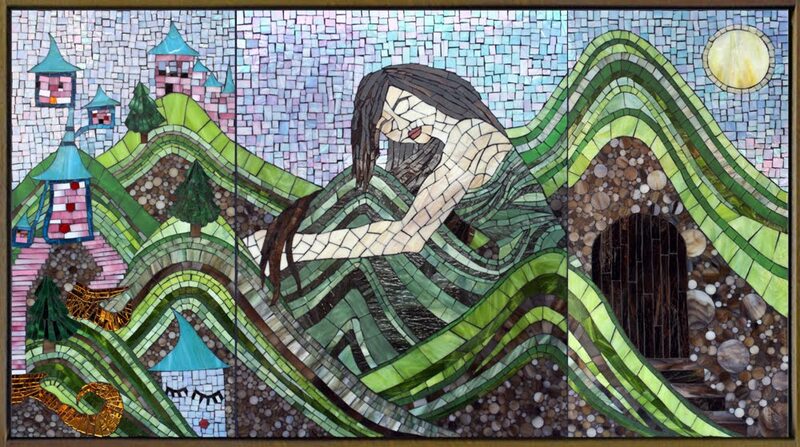 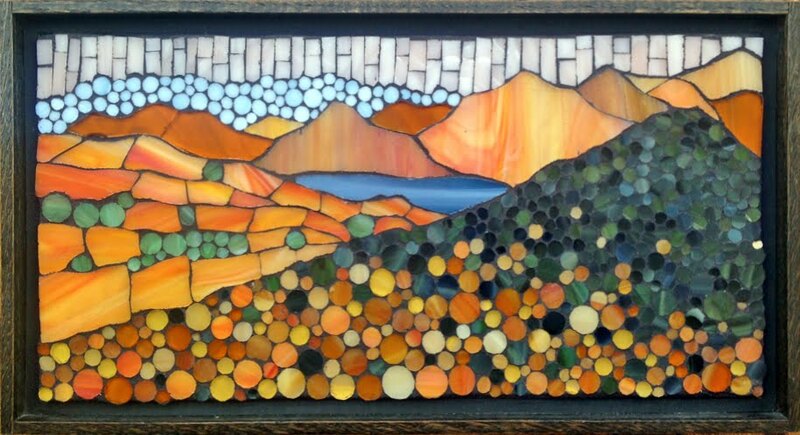 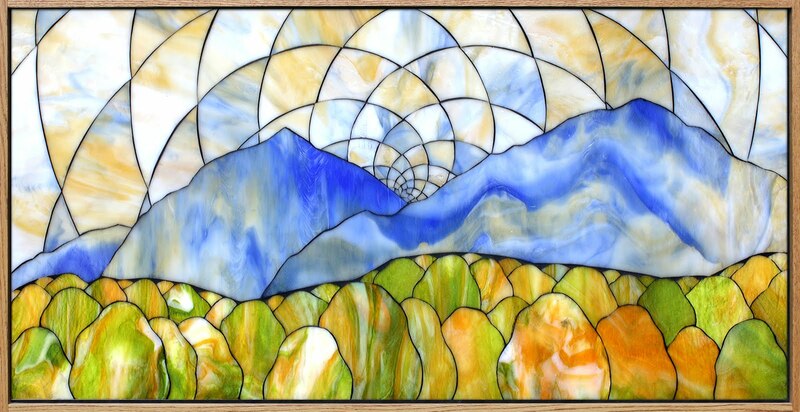 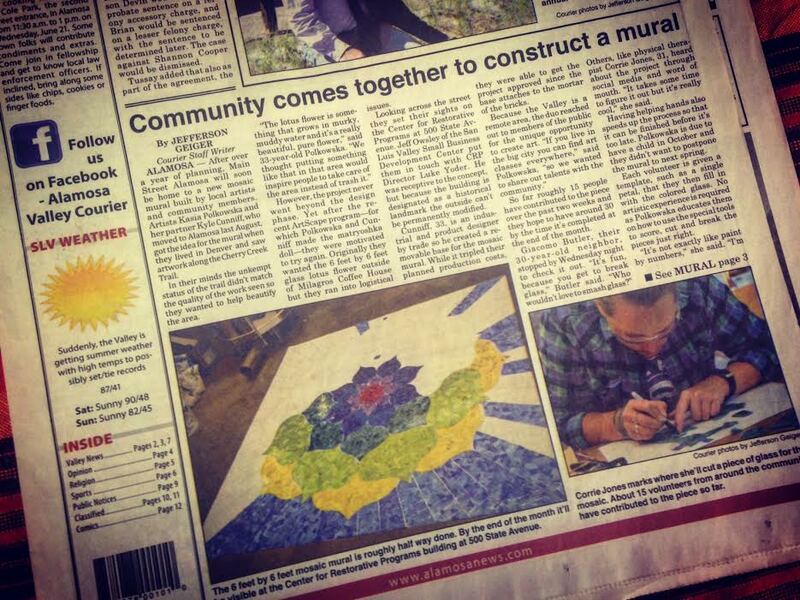 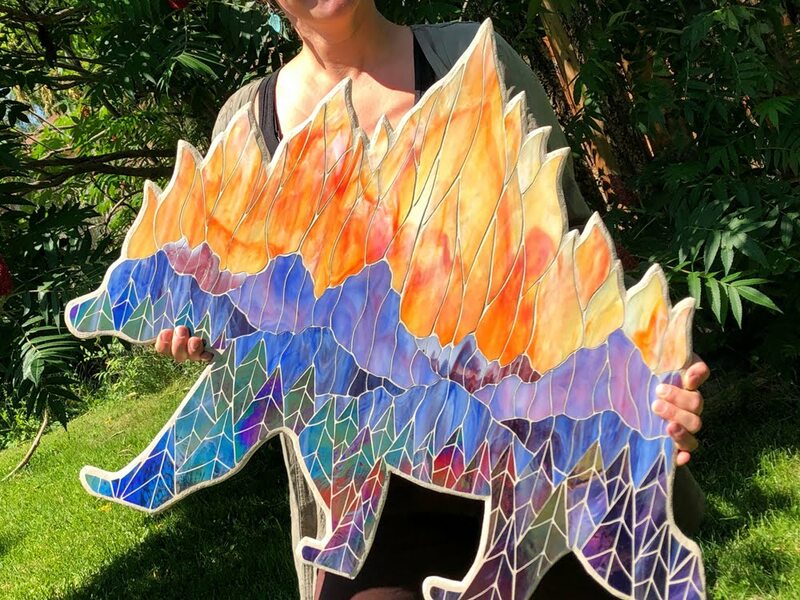 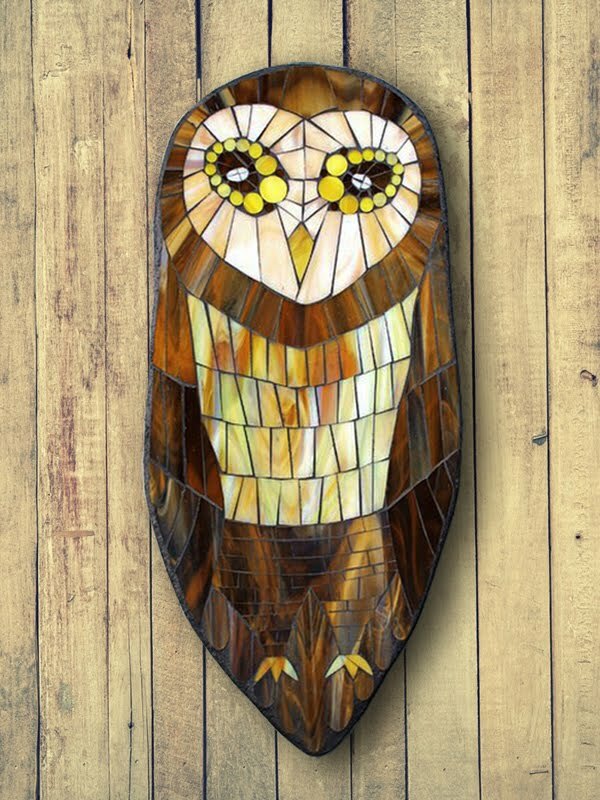 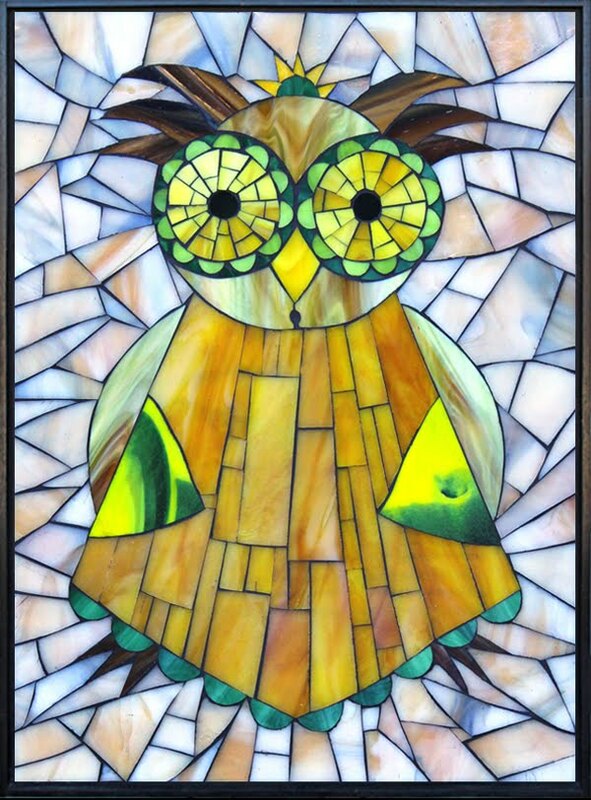 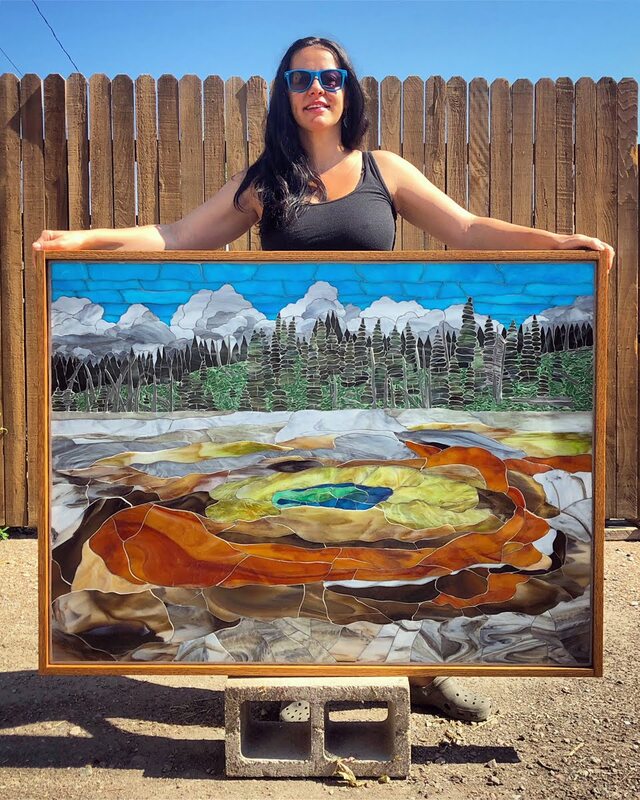 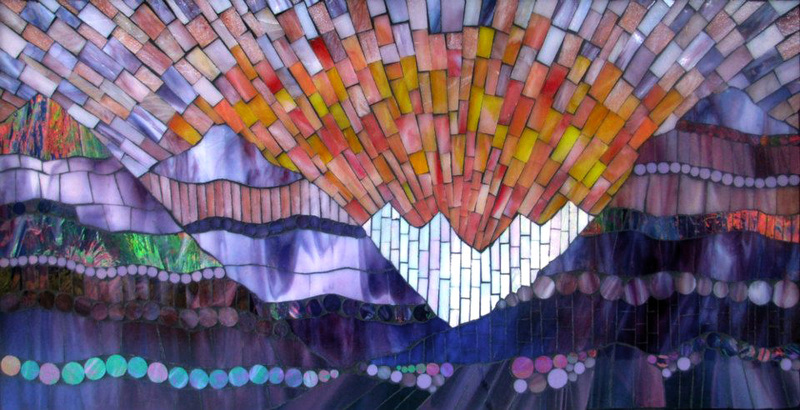 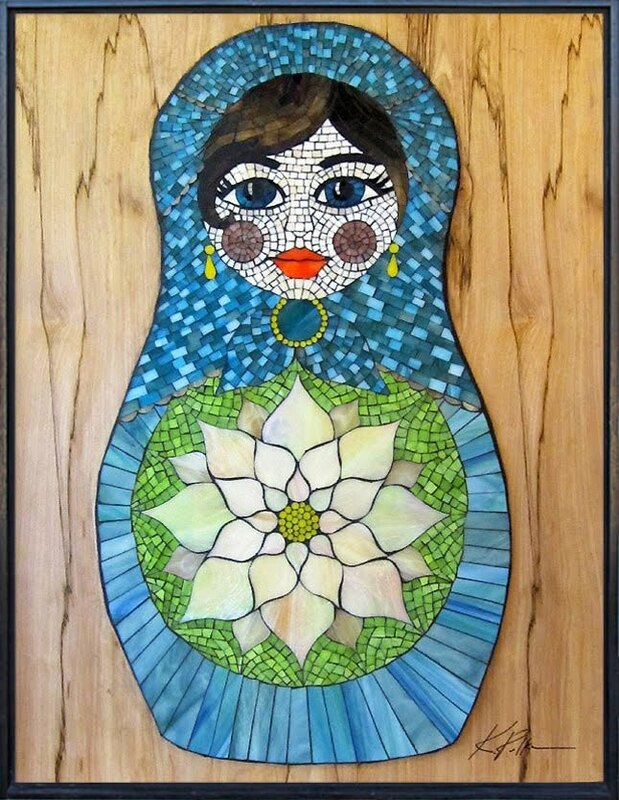 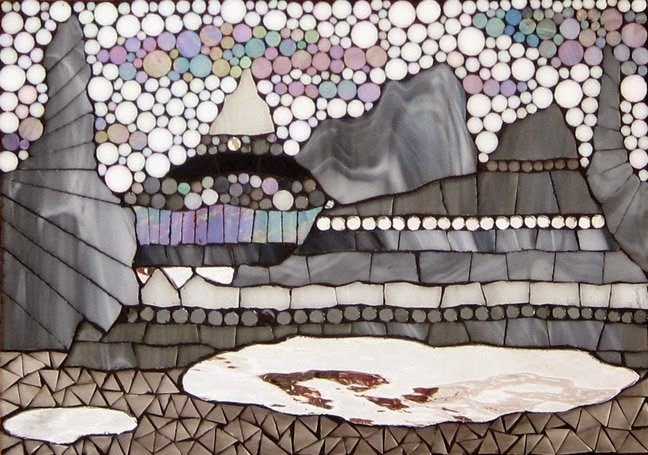 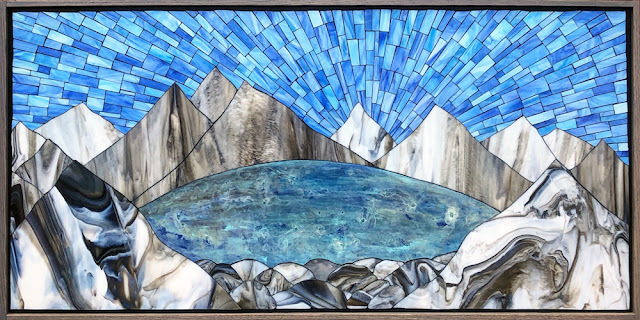 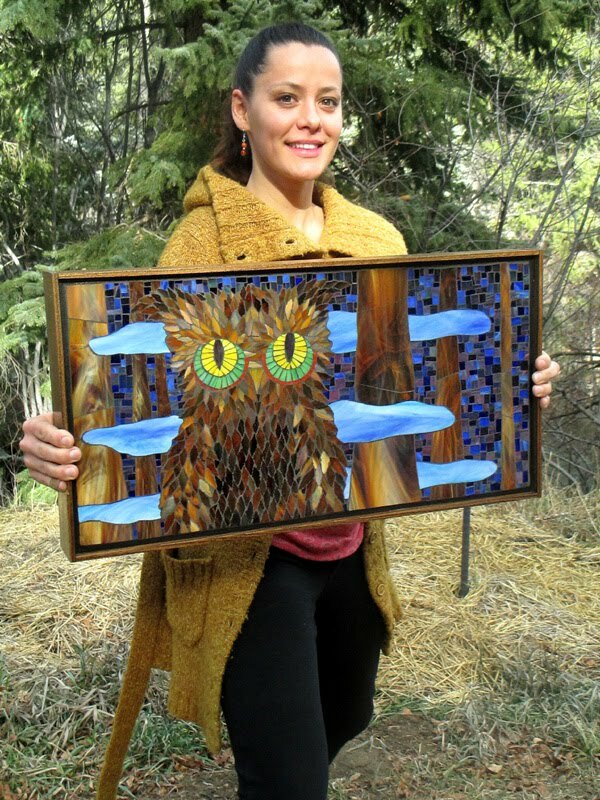 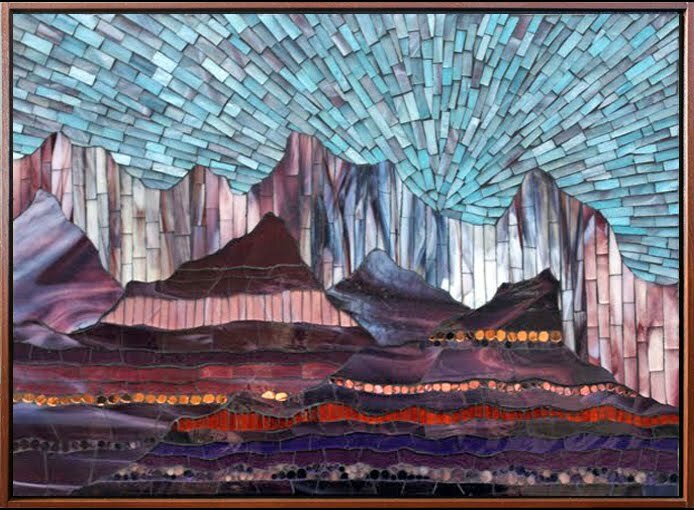 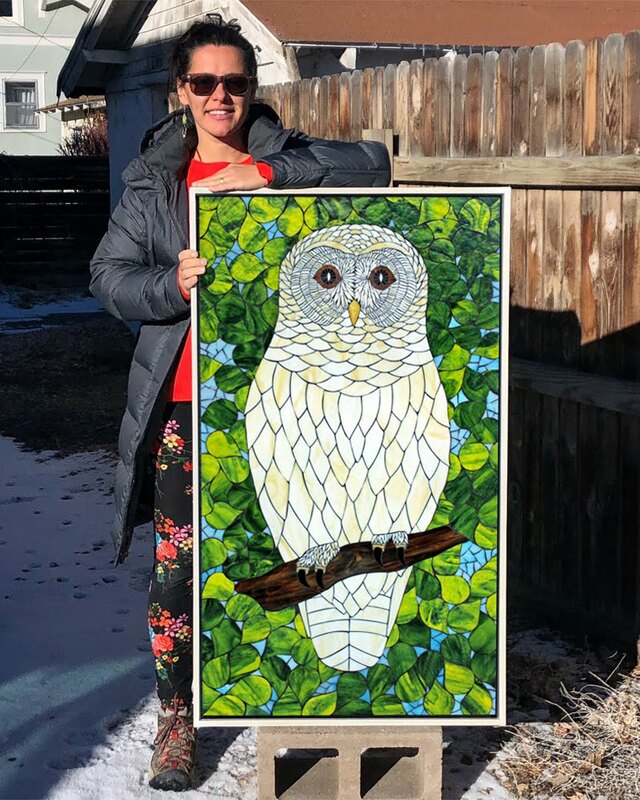 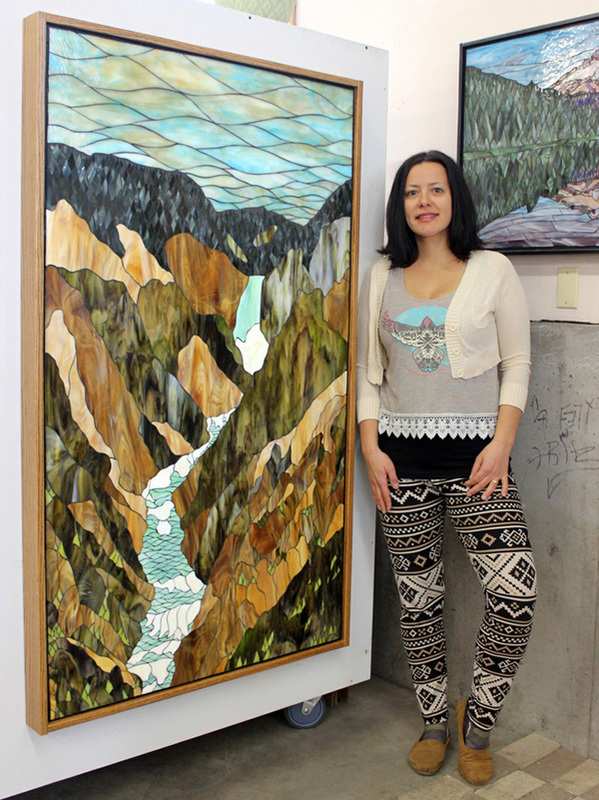 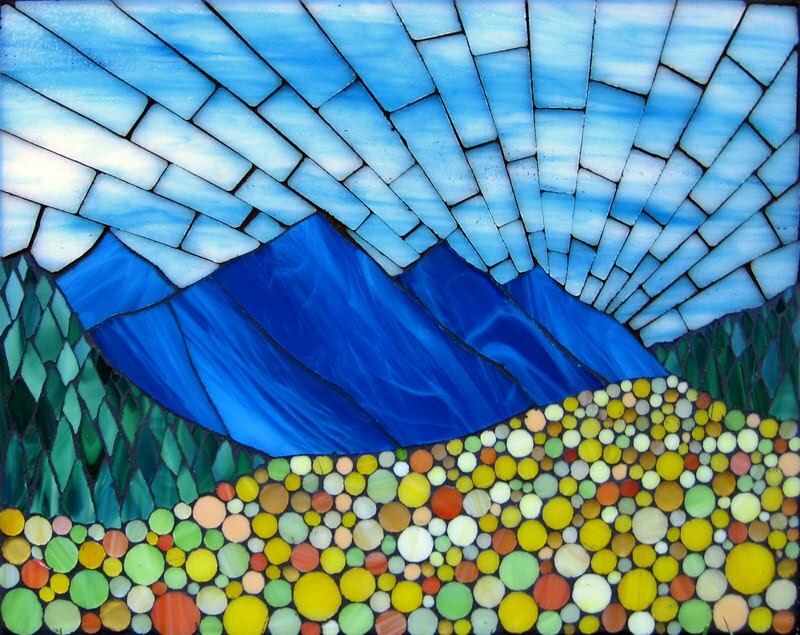 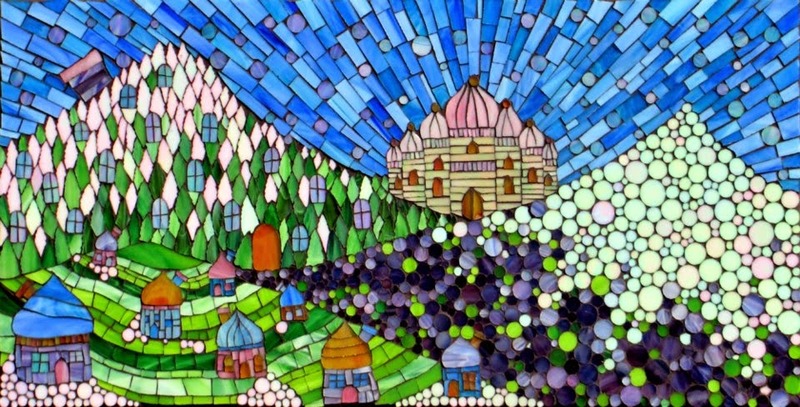 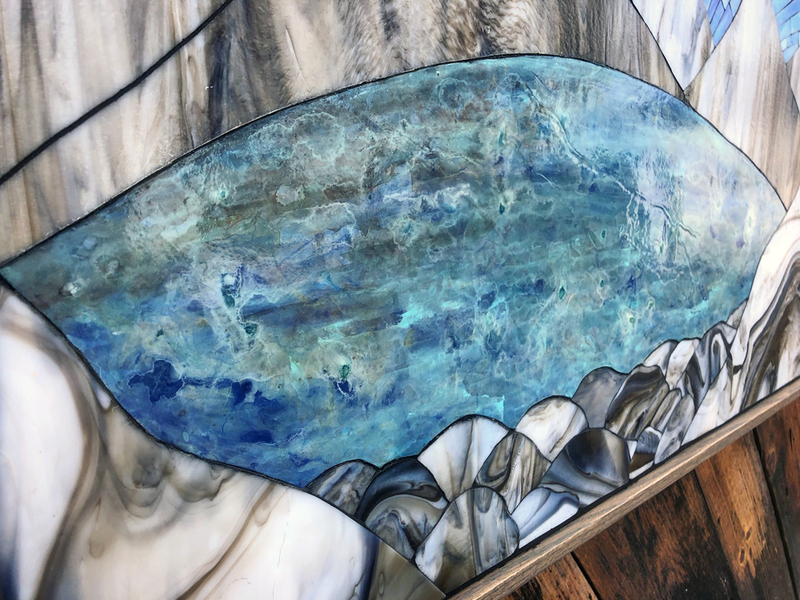 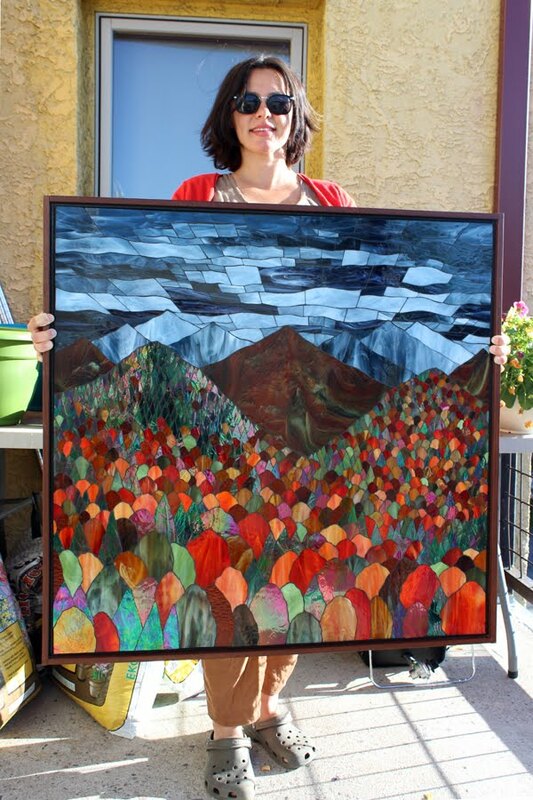 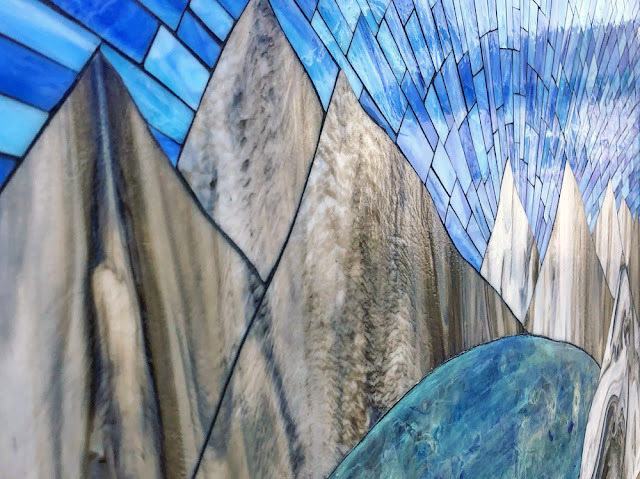 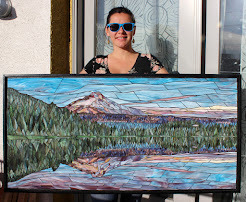 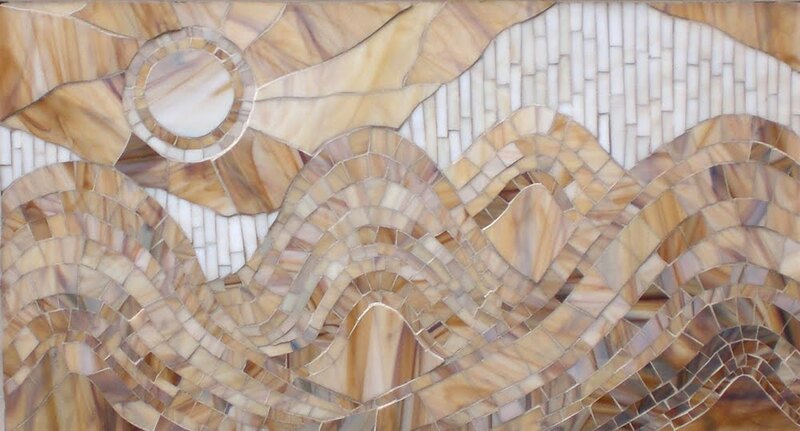 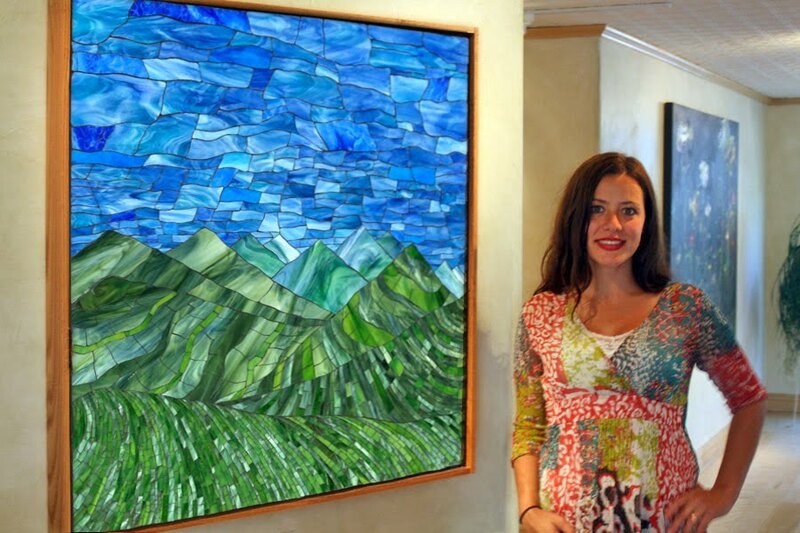 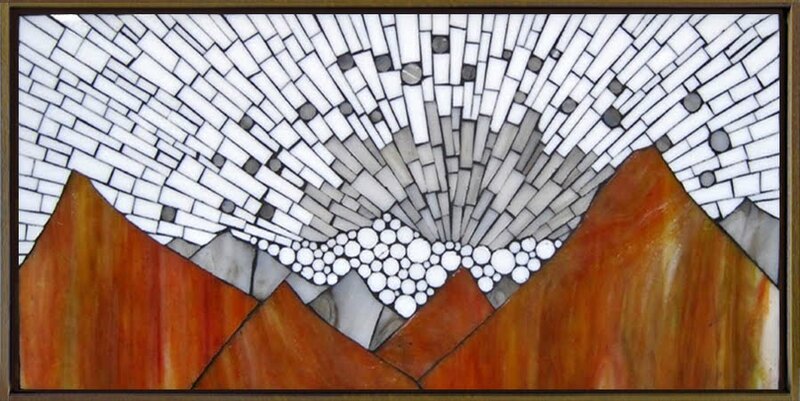 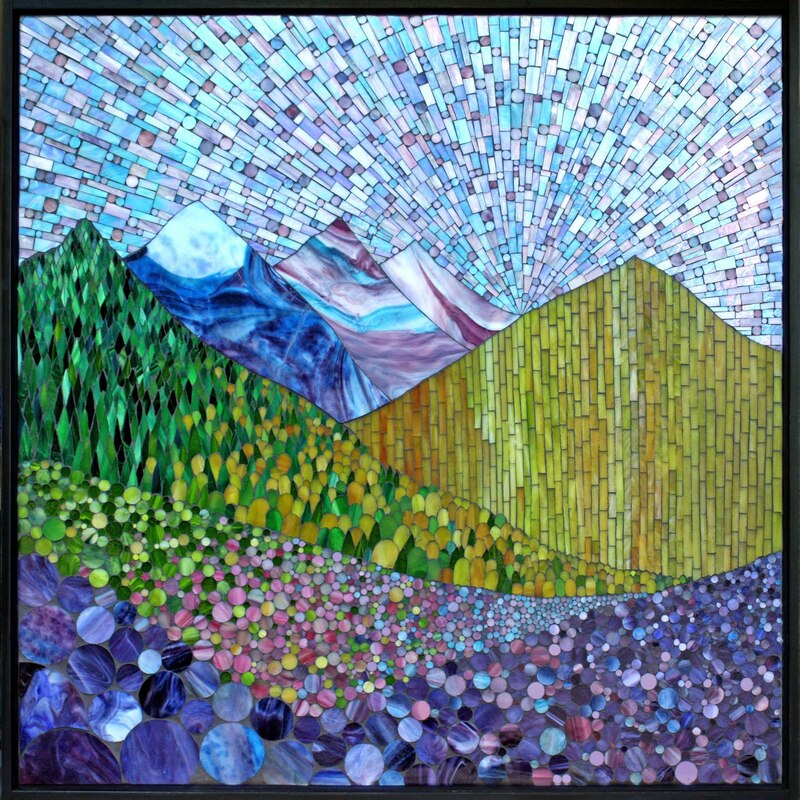 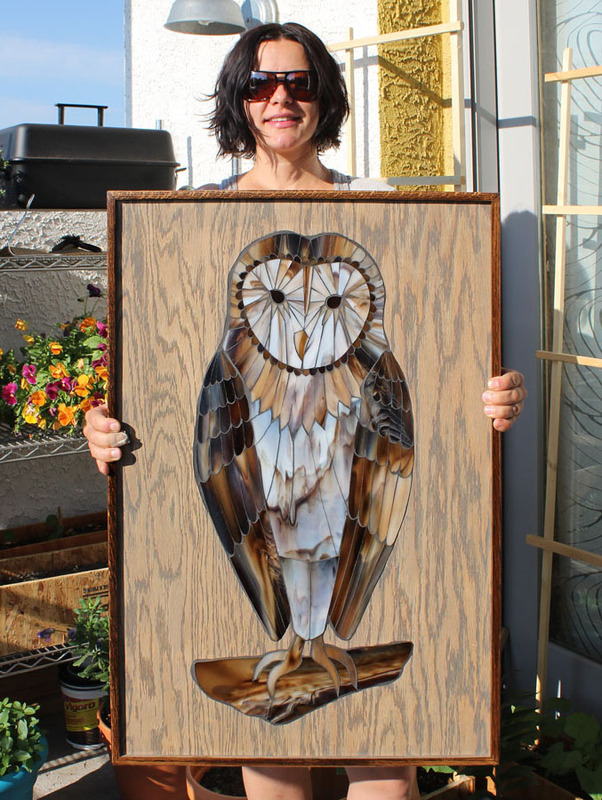 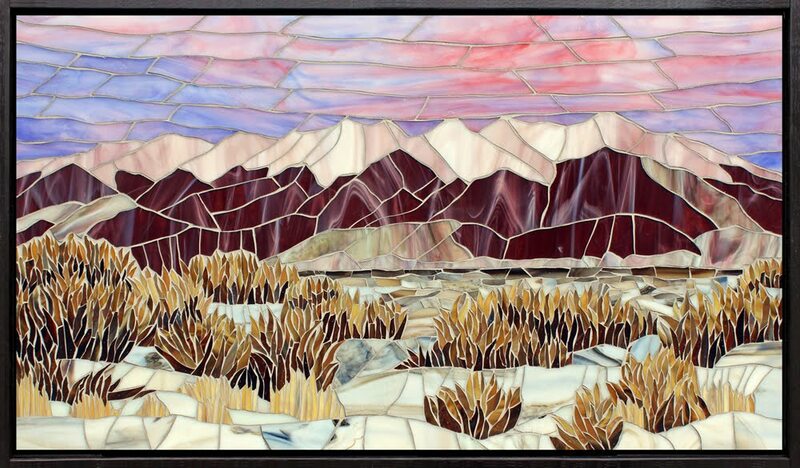 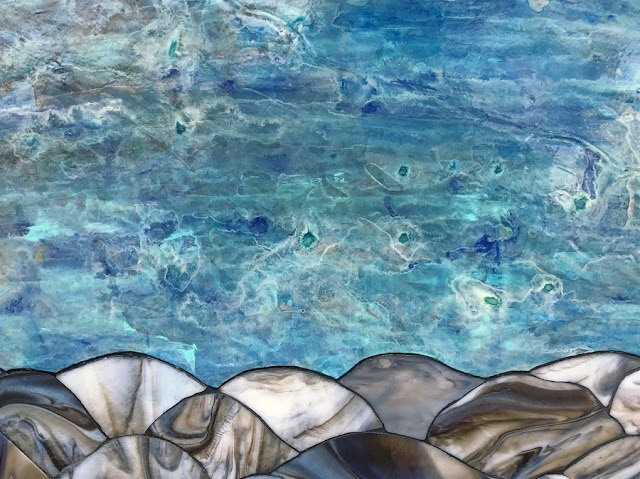 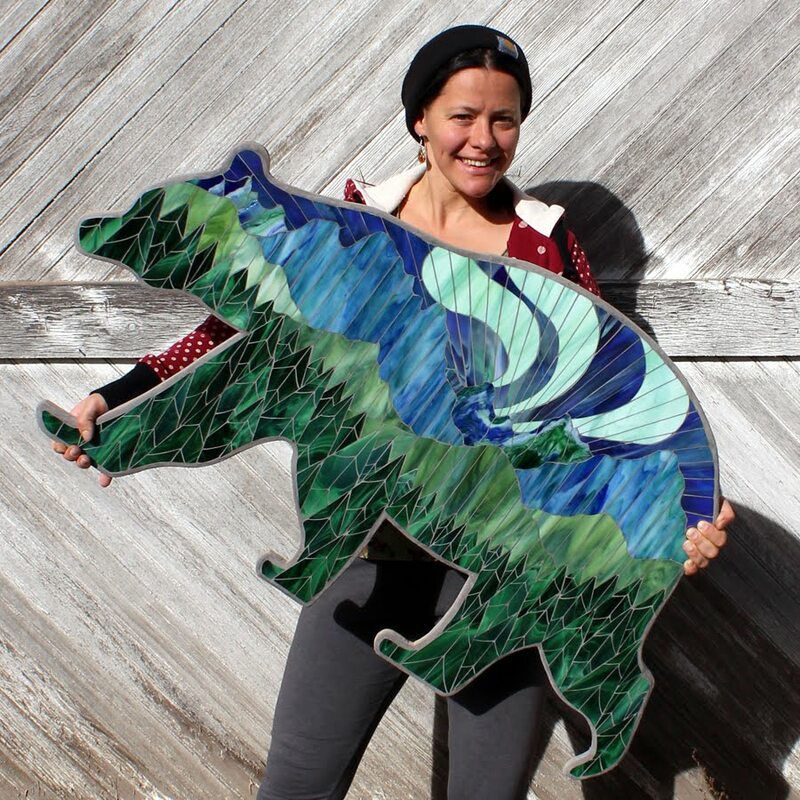 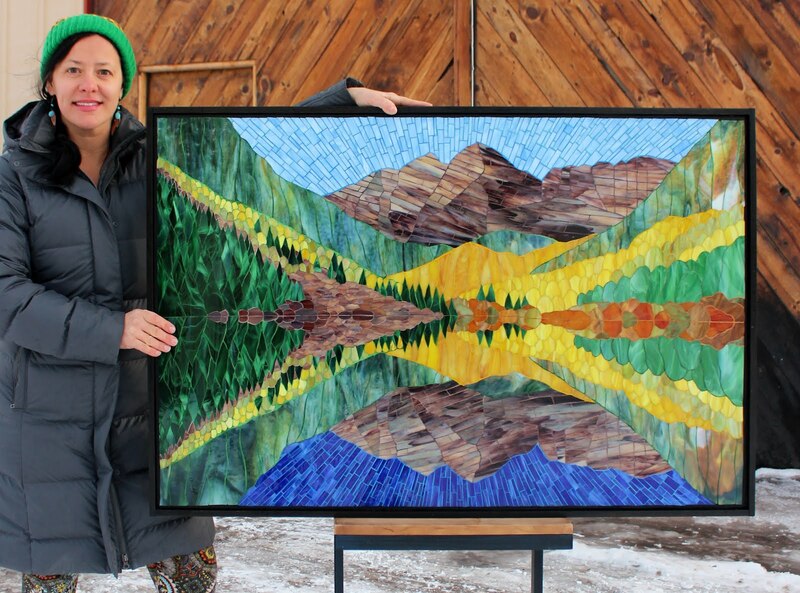 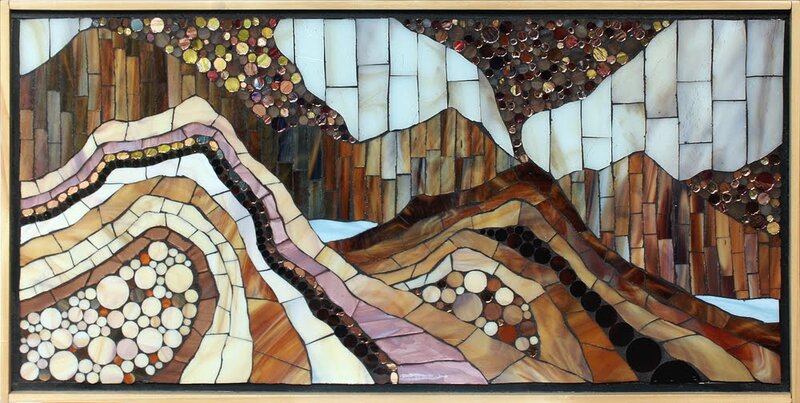 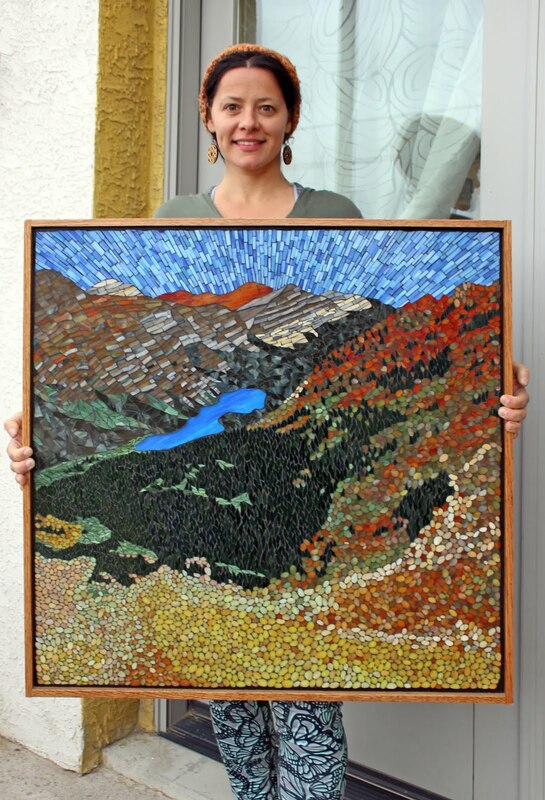 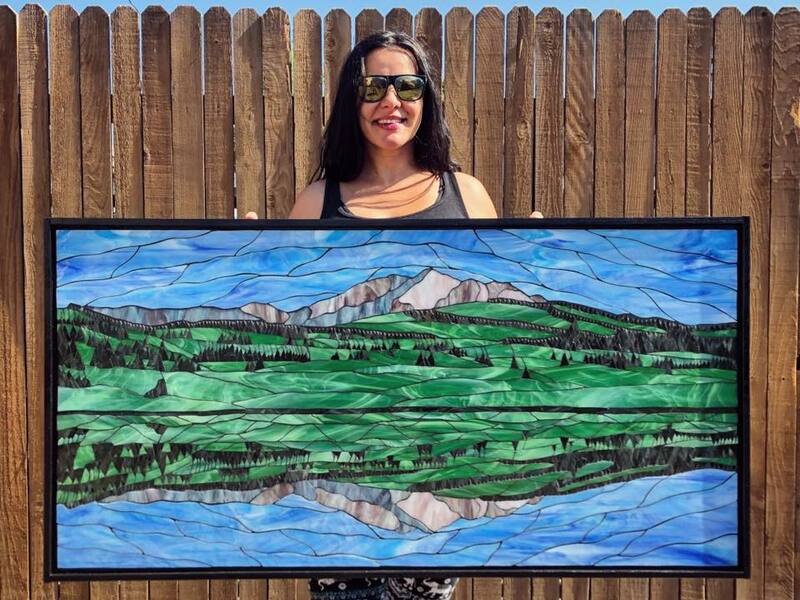 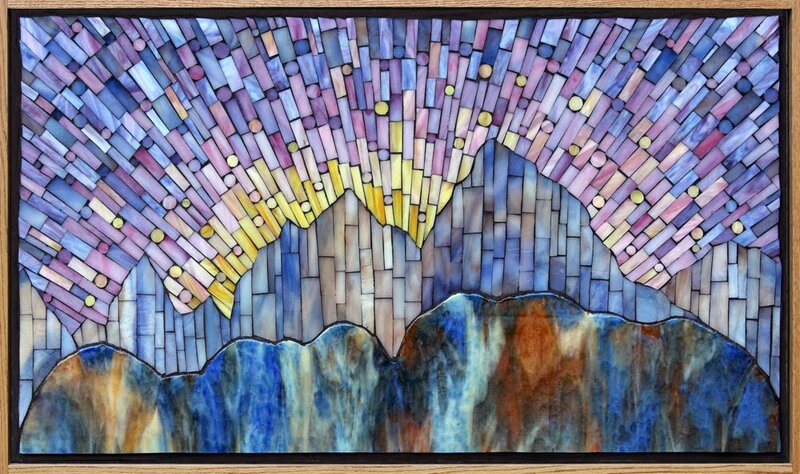 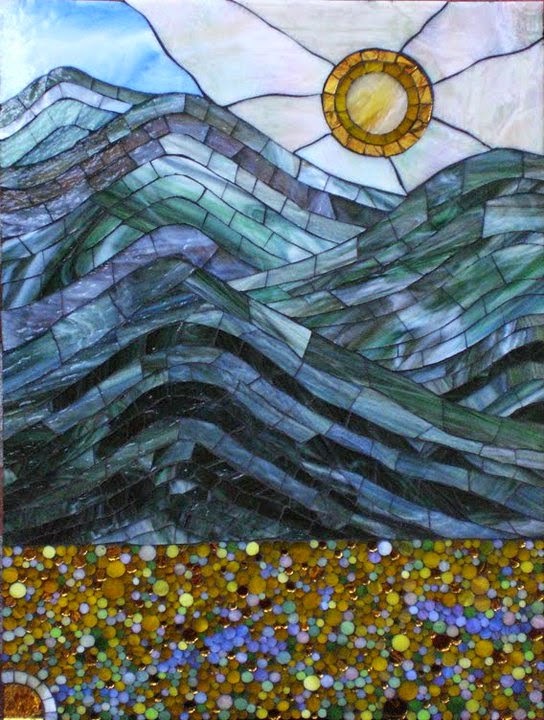 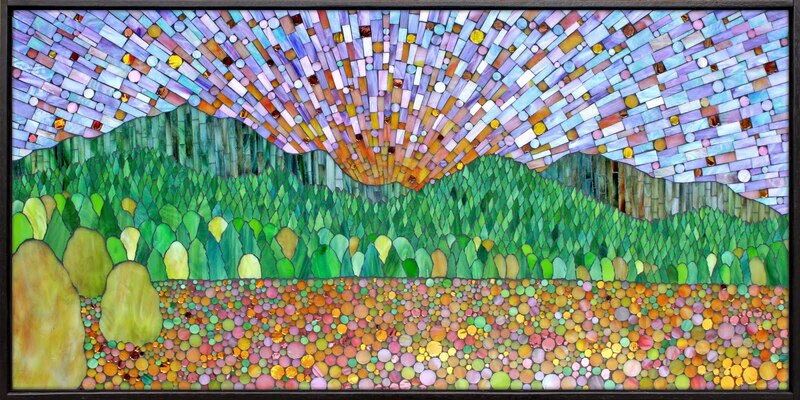 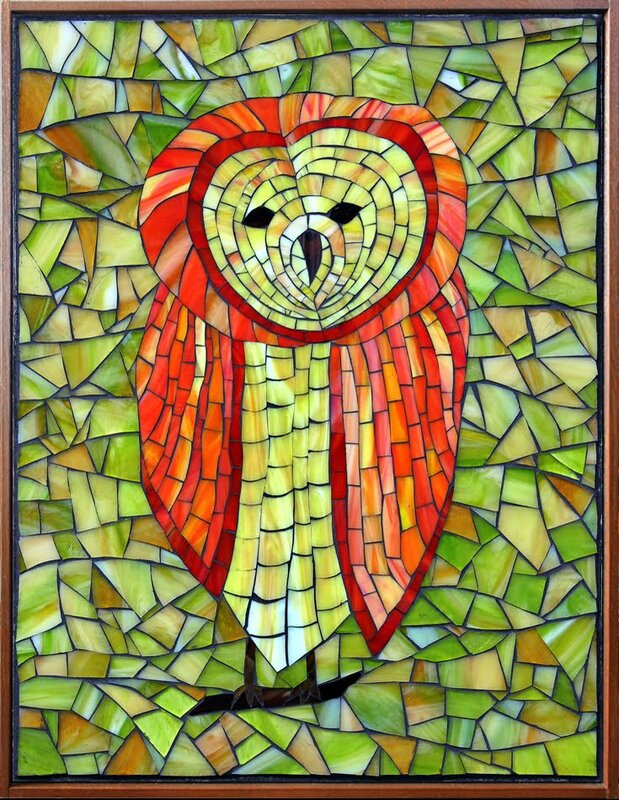 a framed stained glass mosaic, 24" x 48"
Does this mosaic bring you back to an alpine lake you've hiked up to? 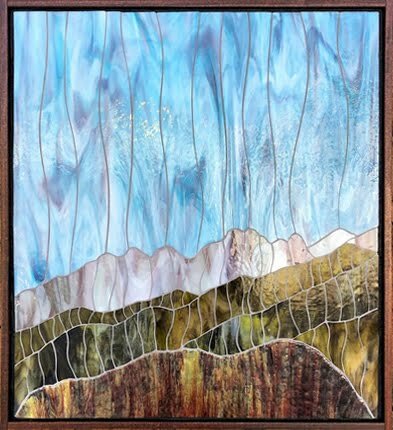 It brings me back to the countless mountain lake hikes I've been lucky enough to treck up to in the Rocky Mountains in Colorado where I live. 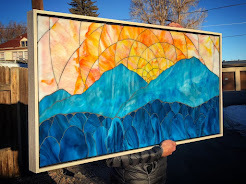 These memories span far beyond to Wyoming, Utah, Montana and Idaho where I've gone on adventurous road trips and quests to see and to enjoy natural wonders new to me. 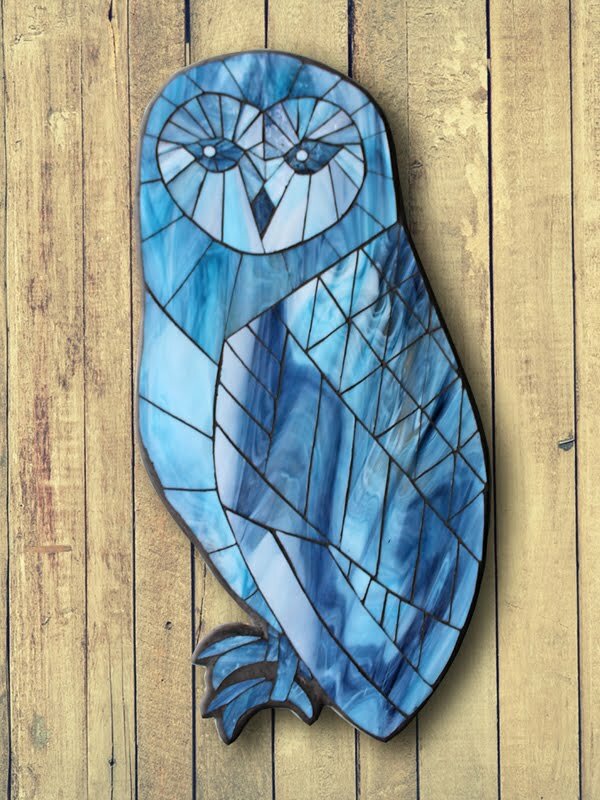 Natural pattern in the blue glass? 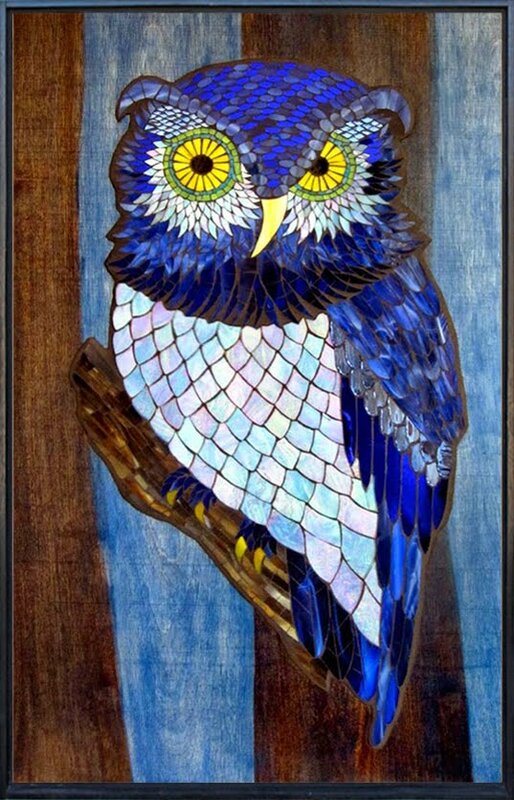 Well, not really ... it was inspired by nature for sure but I actually hand embellished the solid, blue glass to spice it up a bit and to add my special, painterly touch. 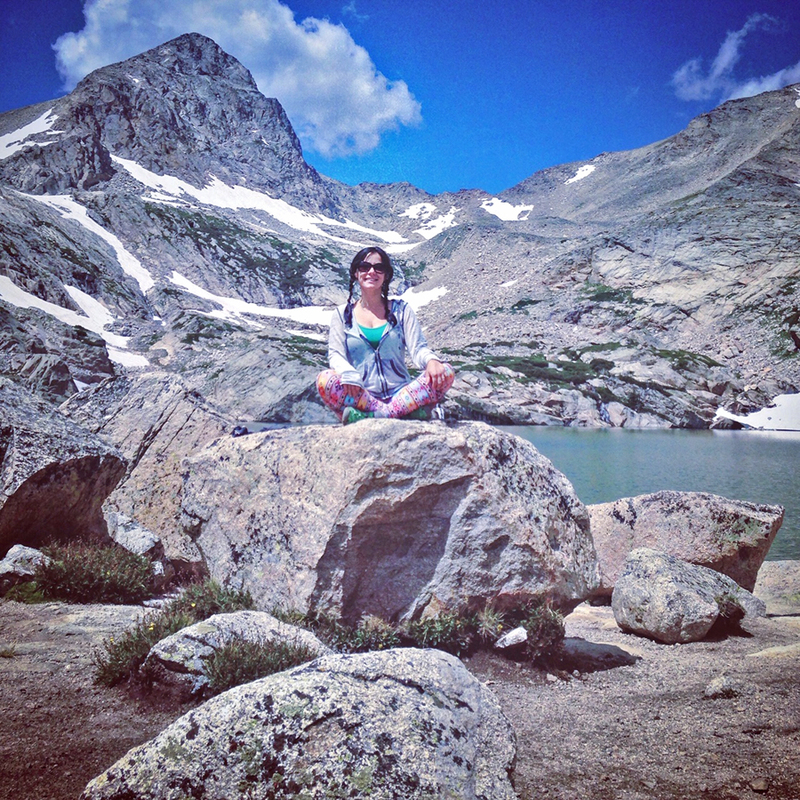 Alpine lakes may be my favorite hiking destinations. 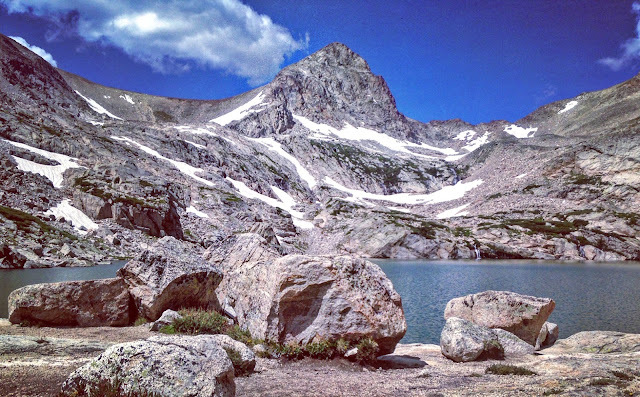 When I lived in Boulder, I loved all the lake hikes in the Rocky Mountain National Park but especially in the Indian Peaks Wilderness which was much closer to the canyon where I used to live. 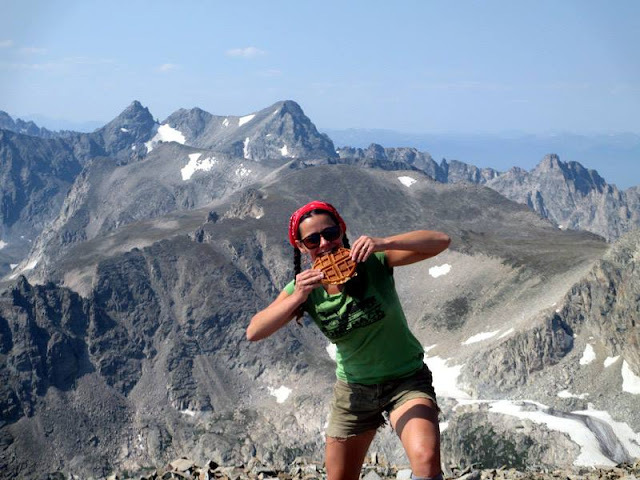 Me standing on top of one of the 13,000ft granite peaks surrounded by mountains that cradle all sorts of pristine alpine lakes that I got to enjoy during that time. 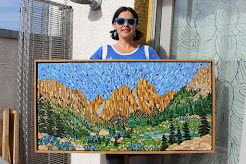 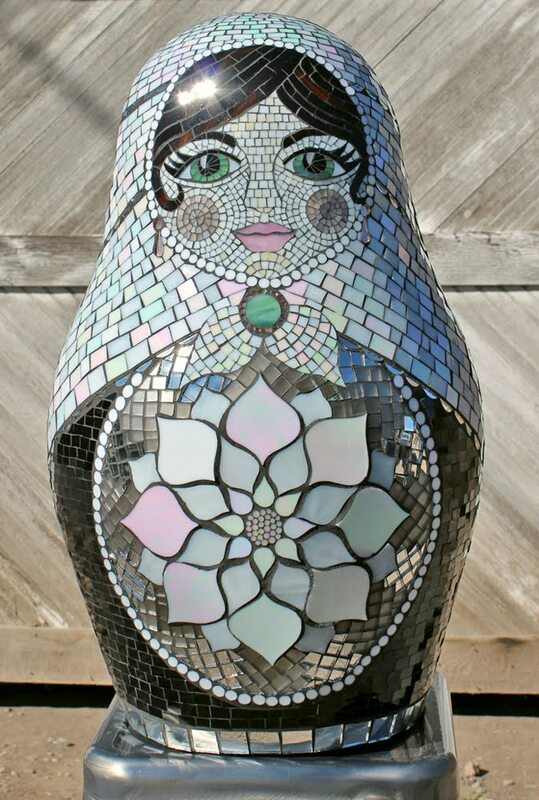 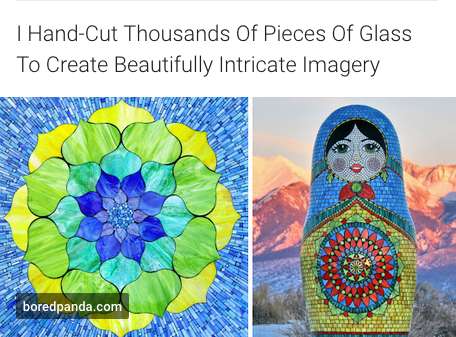 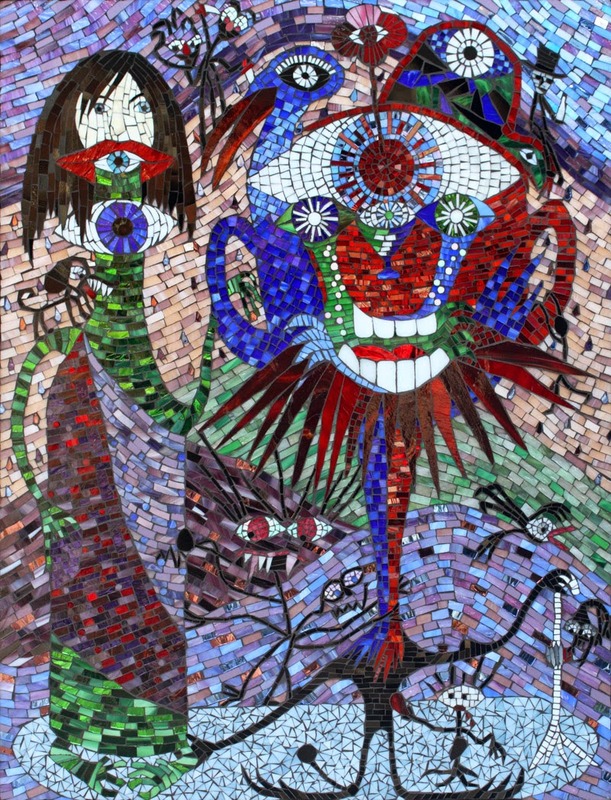 My favorite lake hike in this area was Blue Lake which actually inspired this mosaic. 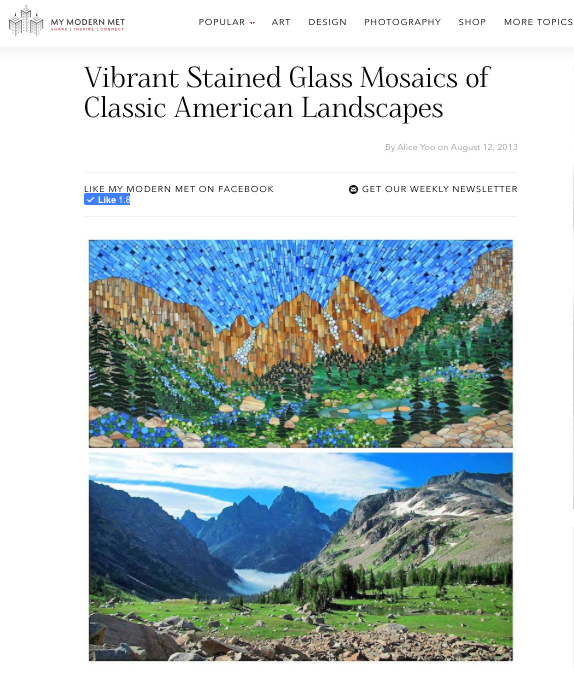 The entire hike is postcard perfect. 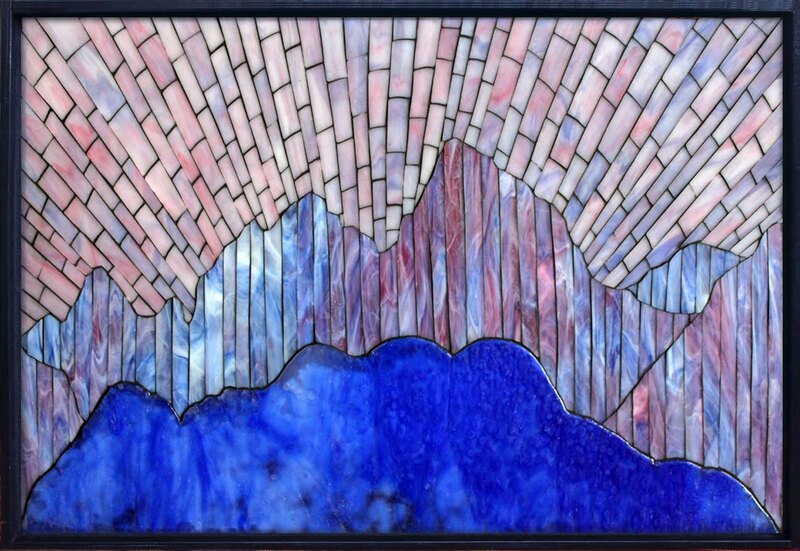 Finally when you arrive at the lake, you are encircled by the prettiest peaks. 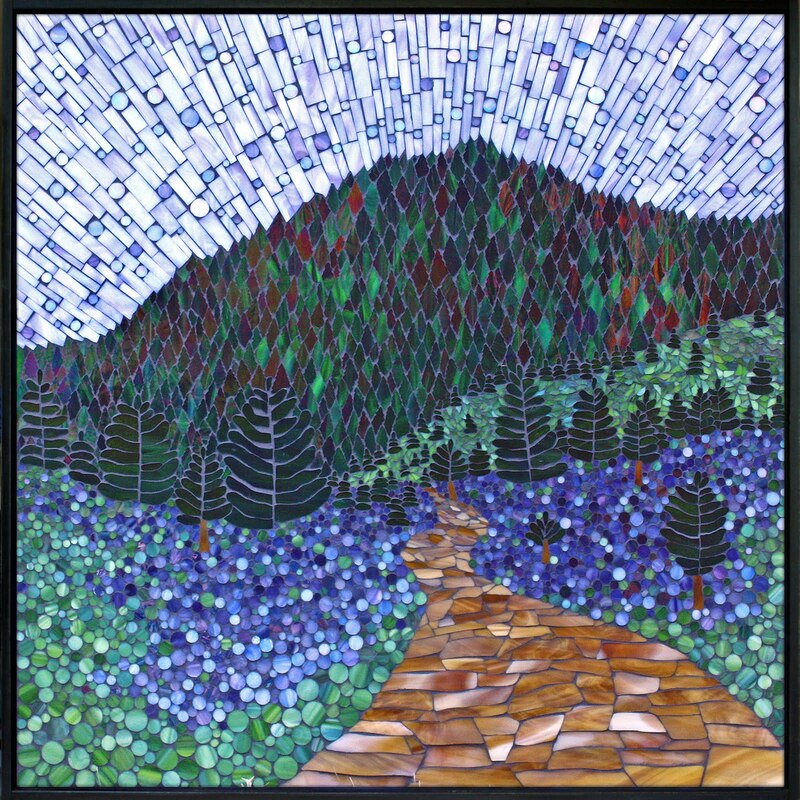 It feels surreal after walking the most colorful wildflower trail to end up encompassed in gray and blue. 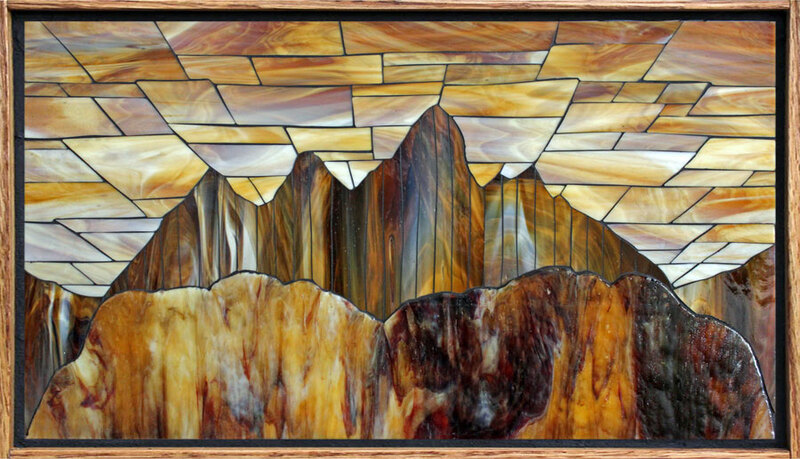 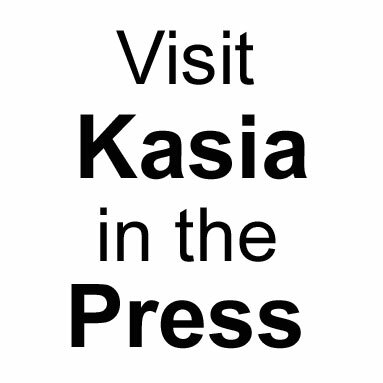 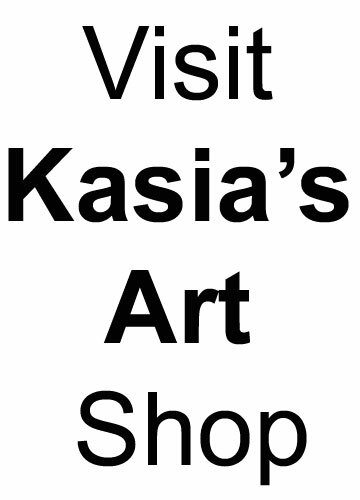 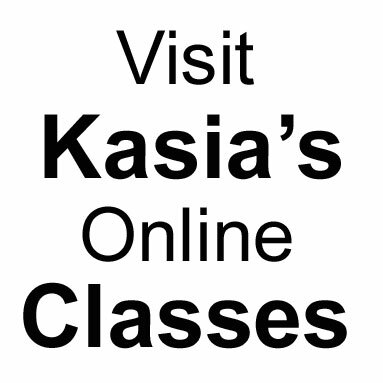 Its like you arrive in granite cathedral. 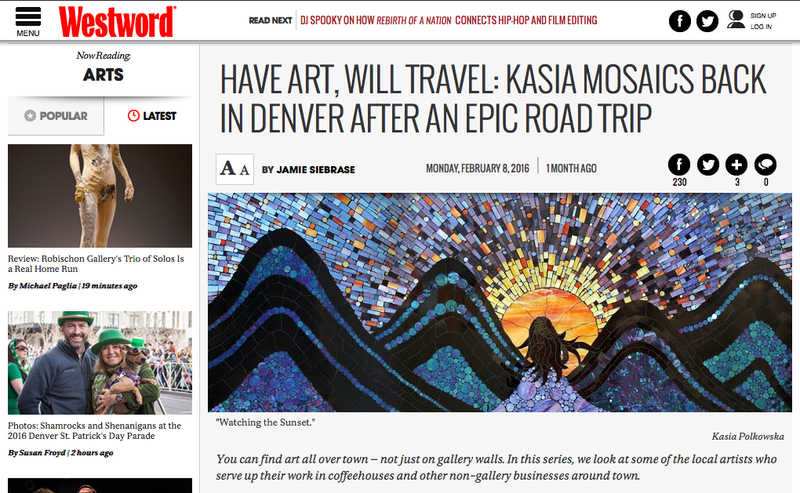 Its very humbling and awe inspiring. 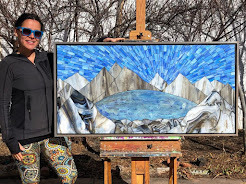 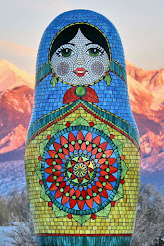 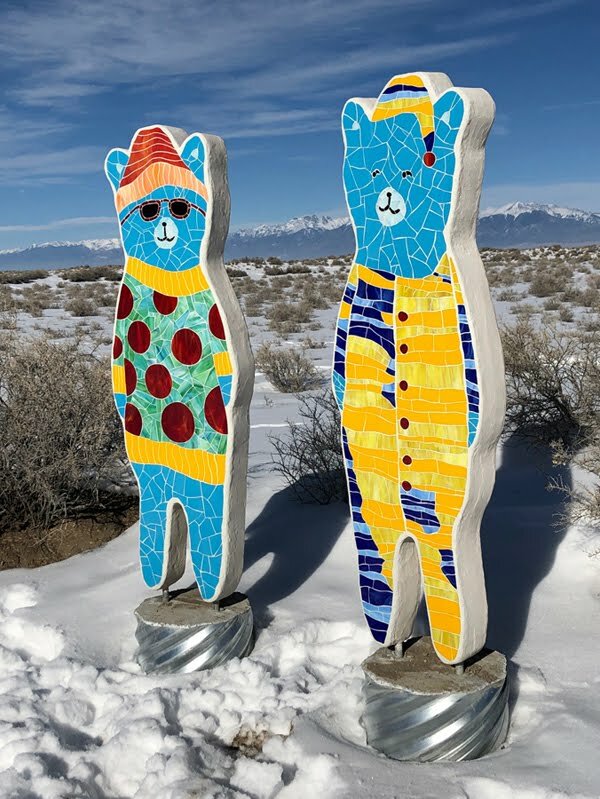 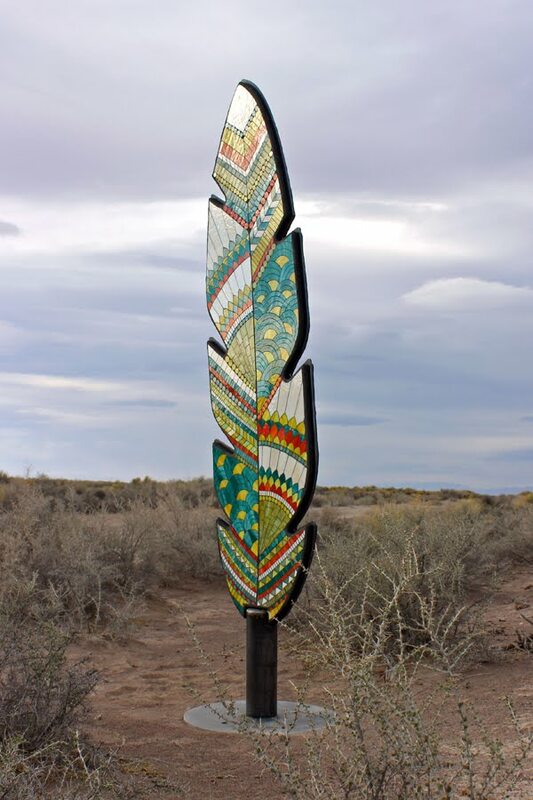 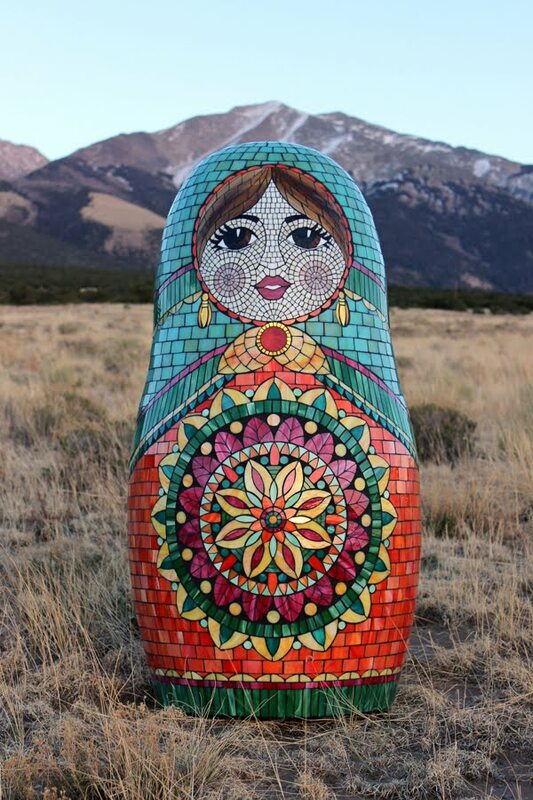 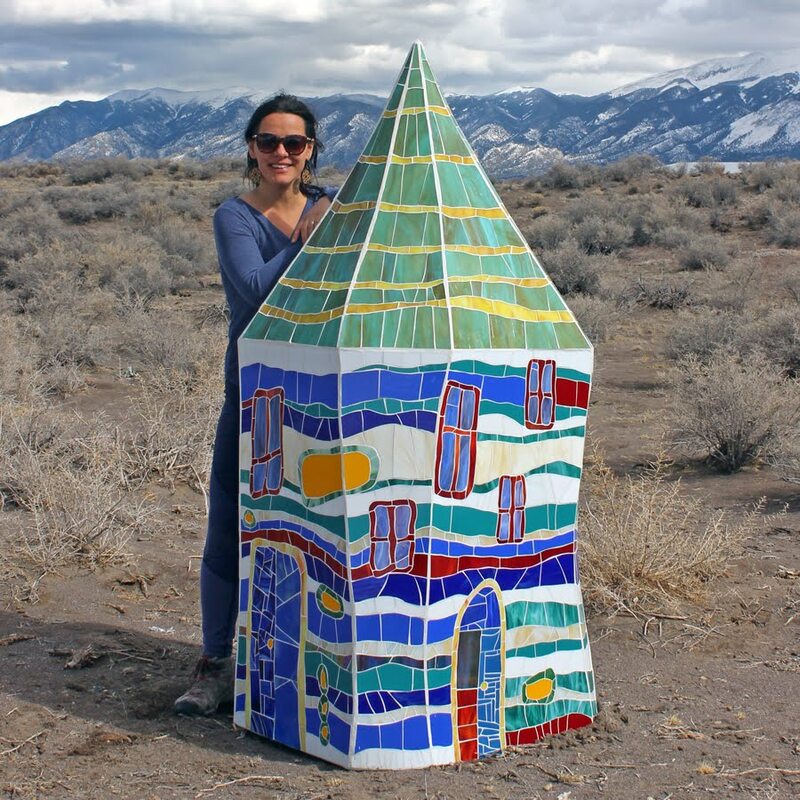 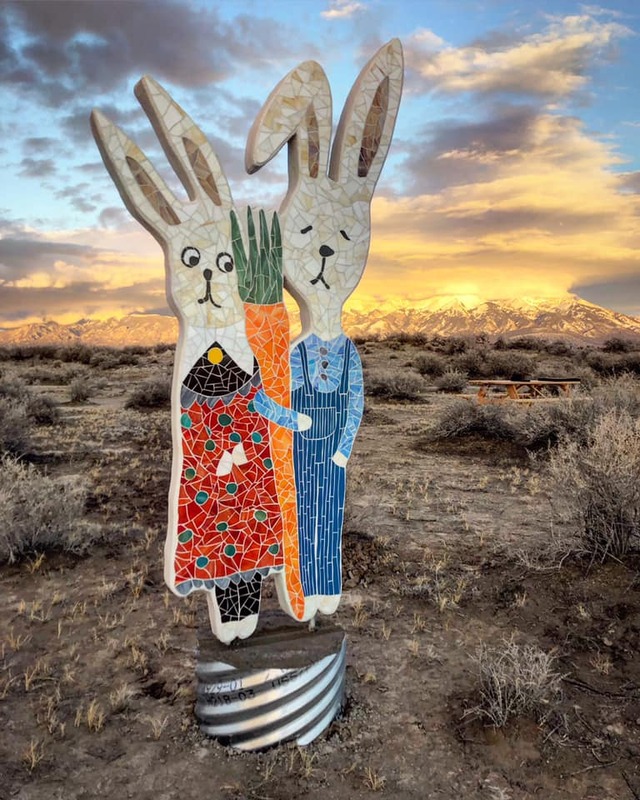 Today when I look up at the Sangre de Cristo mountains which are the local range near Alamosa where I currently live, I think of all those special bodies of water that are nestled among the high peaks - they truly are magical, mystical places. 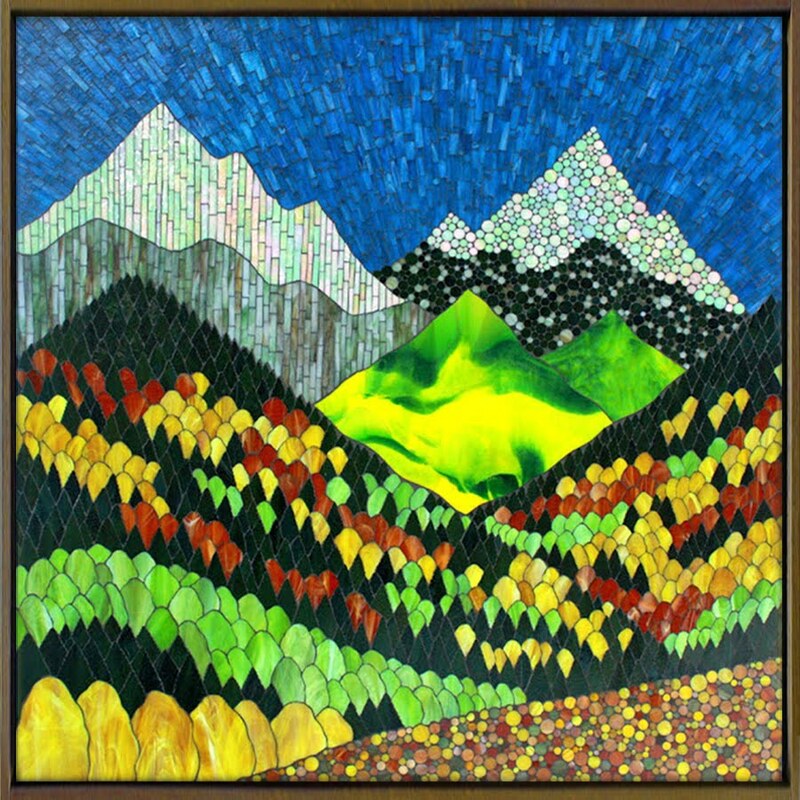 Angle view from the left. 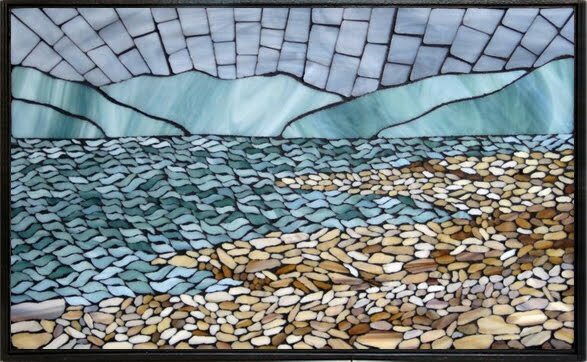 Angle view of the lake. Every time that I get to hike to a place like this, I realize how fortunate I am to be here. 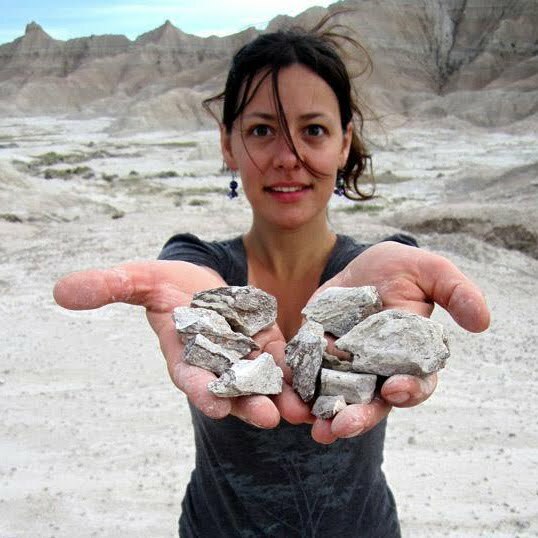 These are very, very special places and I am privileged to be here and I am a very aware of that. 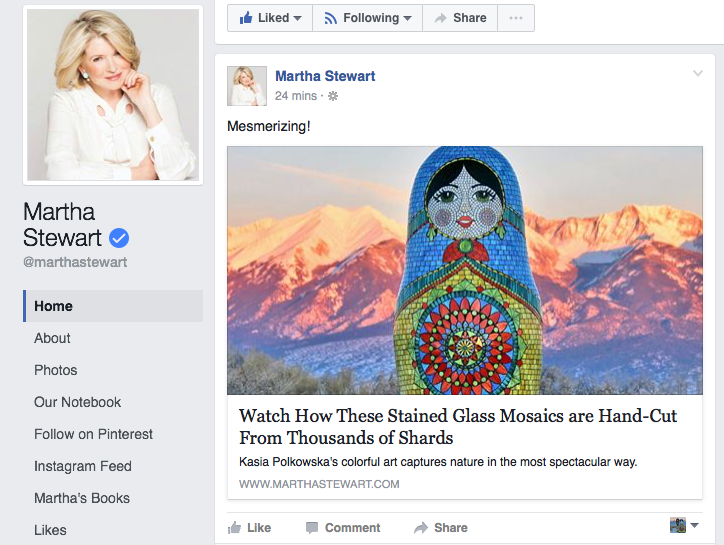 Every step to get closer is so very meaningful to me.